It is already time to start thinking about this year’s baseball spring training! 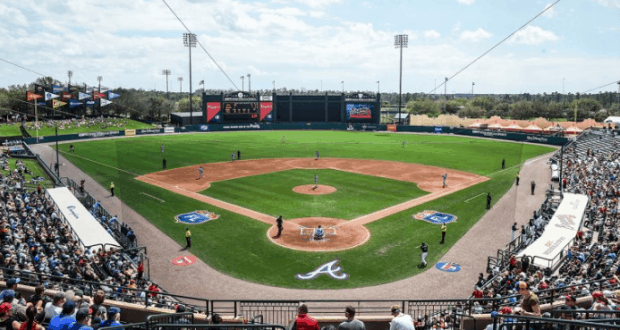 For baseball fans who will be at Walt Disney World, Major League Baseball’s Atlanta Braves will be on property for another season of Spring Training. The Spring Training activities and games will be held at ESPN Wide World of Sports Complex. For guests who are also Disney Vacation Club members, we have learned about another great Membership Magic perk. Disney Vacation Club Members will be eligible for discounts on select games during the Spring Training season. Home of the Braves since 1997, the state-of-the-art sports complex at Walt Disney World Resort will host is final season of Braves action this spring. After this season, the team will be moving to their new Spring Training facility that is located in Sarasota County, Florida. Eligible Disney Vacation Club Members will be able to save $5 on Upper Level, Bleacher and Third Base Lawn seats at select games by using code DVCBRAVES on the DVC Member Ticketmaster page. Who would enjoy checking out the Spring Training Games at ESPN Wide World of Sports?